The Agway 4 Stage Lawn Care Program is formulated to take care of your lawn’s needs all year long. Starting with a crabgrass preventer and fertilizer in the early spring, moving to weed control and ending with a boost of fertilizer to help your lawn through the cold winter months. Available in a 5M and 15M programs. Greenlawn Fertilizer is designed to give our customers a great lawn at an economical price. Available in both straight fertilizers along with combination products, there is a product sure to fit your needs. Available in traditional pelletized or fast acting, one bag of our Agway Fast Acting Lime is equivalent to 5 bags of pelletized lime. Well adapted to full sun and moderate shade, containing a water absorbing polymer around the seed which retains and saves water to enhance seed germination and grass establishment. Ready Green also contains a micro nutrient package of magnesium, manganese, zinc and iron, which is essential for proper plant growth and maintenance. A blend of improved, turf type tall fescue with 10% turf type perennial ryegrass and 5% Kentucky bluegrass that looks good and tolerates wear, drought, poor soils, and low maintenance. Grows well in full sun to medium shade. Ideally suited to full or partially shaded areas. It is a blend of Fine Fescue, Kentucky Bluegrass, and Turf Type Perennial Ryegrass and will grow well in a variety of soils while producing an attractive turf that needs medium maintenance. Sun and Shade has been formulated with turf type perennial ryegrass, creeping red fescue, and Kentucky bluegrass to adapt to both shady and sunny conditions. It blends with existing turf grasses in a lawn area well. Is tolerant to medium traffic and requires medium to low maintenance. 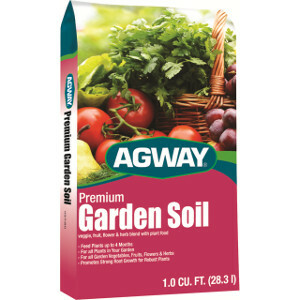 Agway all natural and organic fertilizers for the lawn and garden. A superb natural nitrogen source, excellent for lawns and gardens. Convenient granulated form for easy application. Apply in Early spring and again in late Fall if rebuilding soil. 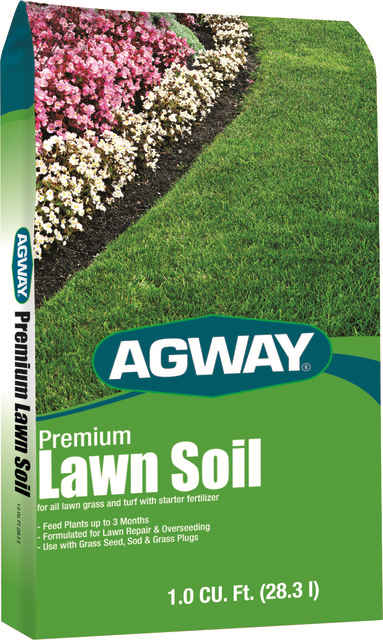 Start your garden right with Agway premium soils and peat moss. Our premium soils can be used for growing vegetables, fruits, flowers along with providing a healthier lawn. Nourishes plants and supports their growth. Agway peat moss provides a natural, organic medium that improves the structure of the soil, while reducing the need for watering and providing an anchor for root development. Every great landscape starts with a strong, dependable landscape fabric. From 5 year to 15 year, Agway has you covered. Top off that landscape with one of our Agway mulch products in either hardwood, pine or our colored mulch line. Agway Lawn & Garden Chemicals offer the same performance as the national brands at a value price. Agway Sprayers are the perfect way to apply many of our chemicals. Using concentrates offers additional value over the ready to use products. Agway offers a full line of long handle garden tools by Alterra Tools Limited. Available in either full length or D-handle styles. An over-molded handle protects the inner fiberglass core for long-lasting durability and a comfortable grip. Shovels, garden hoe, cultivator and rakes, we have you covered. Your local Agway may also carry a large selection of the top national branded lawn and garden products from trusted suppliers like The Scotts Company, Lebanon Seaboard and Bonide.